Print Origami Paper → Harmony Origami Paper 3"
The 3" Harmony Origami Paper contains 200 sheets with 10 different colors. Imagine how colorful your origami can be with this incredible Harmony Origami Pack! 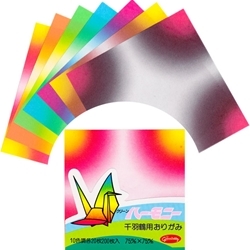 This brilliant pack contains 200 3” square sheets of gradient patterned paper. With ten different color patterns, make endless creations with this Harmony Origami Pack!